Lower Radiator Hose Replacement - Any tips? My '91 with AC sprung a leak yesterday. I figured it was the water pump, as it was in that general area. But usually you see water dripping out of the bearing/shaft when the car is hot. Not the case here, and it took about an hour with a pin point flashlight to see water shooting backwards in a tiny spray jet, back onto the engine block, just below the water pump. And only when hot, and only when it felt like it. Ok, so I have the correct skinny, contorted hose from IAP - I've had it a while. 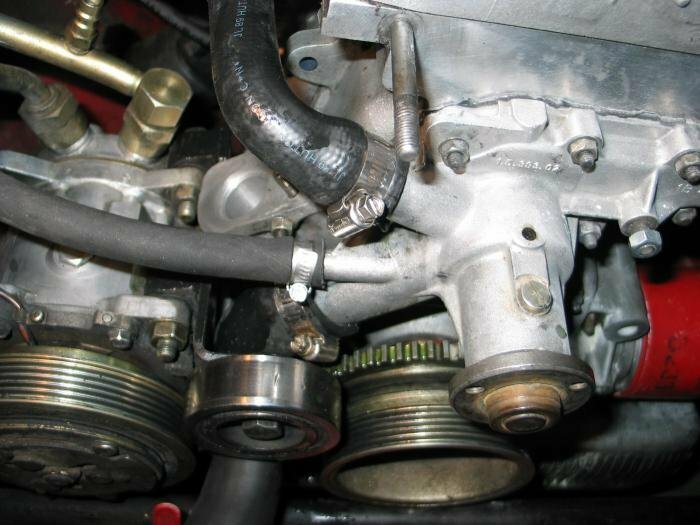 And the reason I've had it because I did a water pump on a previous Spider, and I couldn't get this darn hose on. So on that Spider, I still put the new looking hose back on (I know, I know) because I simply could NOT get this hose to go on, even with silicone lube and some sweet talking. So - here I am, I have the right hose and am about to try to take the old hose off, and put the new one on. What exactly was I misunderstanding last time? The issue with this hose is that its outer diameter at the ends (it is flared at each end) is about the size of the water pump and lower radiator openings. Ok, so the hose will expand later, but how do I physically slide it on - or stretch out those flares a wee bit more? Are there special tools for this sort of thing? Heat? There's really no way to get a grip on things down there. When your arms get down there it's like you're trying to slide it on with one pinky and the back of your index finger. Hold the hose end in boiling water for a cupla minutes. Then it should go on with no problems. I usually just smear a little white lithium grease on each end and they usually slide on after that. I did this last year on my '91 with A/C. 1. Warm the hose in hot water, as already suggested. Then I had that bit of room to twist and squeeze that sucker on! Once the hose was on the fitting a bit, I pushed up from the bottom bend to get it on the rest of the way. Awesome. Thanks everyone for the replies. I feel a bit more confident tackling the job now. Vintre - thanks much. When you say "remove the belt tensioner" do you mean to remove the actual roller, or the entire assembly? Or which is easier? Also, this may be the factory hose, as the screw on the clamp on the radiator is facing down. I don't think there's access from underneath. Is there a way to just cut a clamp that's screwed down tight? Just the roller. I couldnt get the bracket off, I don't remember but some of the bolts were not accessible. Maybe use a dremmel to cut through that clamp? Me no like grease on hoses and possibly in the coolant. Use some dish soap. That will mix well and dry. Agreed on not using grease or any petroleum based lubricant on the hose. It will soften up the rubber over time and you will be right back to having a failed hose. A little liquid dish soap or some tire lube (the stuff they swab onto your tire beads before installing the tire on the rim) is the way to go. The soap will make the rubber very slippery, so try to only get it onto the inside of the hose ends and not all over the outside where you need to grab it with your hands otherwise you will find you can't get a decent grip on the hose. Even with the hose ends nicely lubricated it still is a struggle to install the hose, but just keep at it and eventually it will go on. Dishsoap it is. And thanks Vintre for the tip about removing the roller. Should be tackling this little project this weekend. I'm glad I've avoided a water pump replacement for now. make it 4 yeas for dish soap.......also, boiling water and dip to soften it up a plus. Ok 2 more questions. I have everything off as above, and even with the tips and tricks, there's no chance of this hose going on with the compressor and roller bracket in the way. I need to be able to get my hand around the hose and push it on. As is, I can barely get my fingers on it. So - unless there is some way to slightly enlarge the opening on the hoses. Perhaps shoving something in them, heating them up, and cooling them - I am going to have to loosen and remove the AC compressor and the idler pulled bracket - and possibly the distributor as I may need to remove that to gain access to the necessary bolts. This is an IAP hose - looks great, and I don't think it's the problem. It will clear the crank pulled teeth, etc. As with most hoses, its designed to be a bit smaller than what it's being fitted to. Back again - I retract my comment on the hose. I don't think this hose is going to work. I can't even get the lower portion onto the radiator fitting. Bottom line is that this hose is too small. I don't even think removing the AC compressor will work for me. Anyone have any luck with different vendors lower radiator hoses? In reading on here, it seems like the issue was the hoses weren't the correct shape, and were ruined because of the crank pulley rubbing against them. This IAP one looks like it will easily solve that problem, but the larger problem is that it literally will not go on. So perhaps I am fighting the hose, and not the car. I've dipped it in boiling water, slathered it in dishsoap, and even when I can get a good grip I can't get this hose on. Somethin aint' right here. I sent mine to the shop to have all my hoses and belts done. I sent all my parts including the IAP lower radiator hose. No complaints from the mechanic. Maybe it was because it was on a lift when he did it and was able to get more leverage? Before you give up, try forcing the hose over the end of some PVC plumbing pipe pieces or fittings that are approximately the same diameter as the water pump and radiator fittings. Then heat the hose in boiling water with the pipe pieces stuck in the ends to try to expand it. Let the hose cool with the pieces of pipe still stuck in it and let it sit for a day. This should expand the ends of the hose sufficiently to allow it to be installed on your car. I had my car on a lift when I was installing a new lower hose on it and it did not offer any advantage to try to work from underneath. I ended up putting a fender cover over the passenger side fender and forcing the hose onto the fittings. I was a bit unsure that the radiator could take all the force, but it did and there were no leaks afterwards. I have to admit that what should be a very easy job turns out to be a major struggle when installing one of these hoses. The radiator hoses are made with fabric in between the inner and outer lining. Expanding them really should not work like that. Otherwise when the system is under 15-PSI pressure, they would balloon up. Maybe heating to be "softer" will help. Otherwise it's just HARD work to get it done.